Over the last two decades, numerous books have been written about the expansion of international companies into China and one common denominator stands out. Every international company that is successful in China today agrees that it has proved to be far more difficult than they had anticipated. The successful companies have managed to embrace the complexity that exists in talent acquisition and talent management in China. They have taken into account the cultural and legislative differences and, rather than looking to fit their local workforce into a global set of rules, have moulded Chinese practice into their business model without jeopardising either their integrity or their overall business objectives. 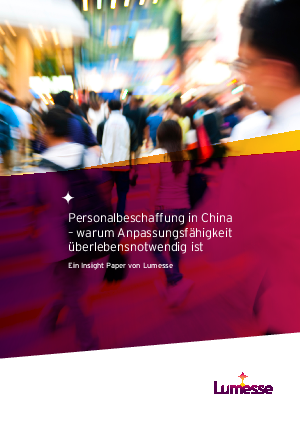 Download now to understand the peculiarities in recruitment and talent management that exist to help ensure that you are successful in your expansion into China.